Everybody has a theory about what’s wrong with the kids these days. Some scream that they play too many video games. Others say that they eat too much fast food. Some say it’s the teachers, whereas others say it’s the parents. Some argue it’s cell phones and others argue it’s street gangs. But if all of these people have one thing in common, it’s that they believe there is something wrong with this generation of children. Louv takes a close look at many of the chronic problems that children have today and relates them directly back to wilderness and nature oriented experiences. On the one hand there are the creative elements that evolve in children who spend time outdoors. They create games and fantasies, build forts and take on characters. On the other hand they develop a number of higher function cognitive and psychological skills by spending time in such an environment. They do this through self-imposed rules that evolve out of unstructured play. Louv provides an apt example with a discussion about a treefort. Children learn a great deal from both the building of the fort, as well as the subsequent play in the fort. First, there’s the construction. That’s where they learn about architecture, mathematics and geometry. Then there’s the use of the finished product. Suddenly, it’s no longer a bunch of wood haphazardly nailed to a tree, but a spaceship or a castle. This unstructured play allows children to stretch their imaginations. Their fantasy worlds have rules (i.e. the tree is a monster and if you touch a certain branch it will eat you). The playacting that takes place in a tree fort allows children to work on their executive function. This cognitive skill is incredibly important to a child throughout his or her entire life. Strong executive function helps students concentrate in school; it helps them control themselves and it helps them understand abstract concepts. Louv offers a number of dire warnings in his book. Children who don’t spend time outdoors will not value green space or fight for the environment in the future. Children who don’t go camping or spend time in national parks will not become stewards of parks and wilderness areas. Children who don’t spend time outside are far more likely to develop childhood obesity, ADD or ADHD among a number of other ailments. 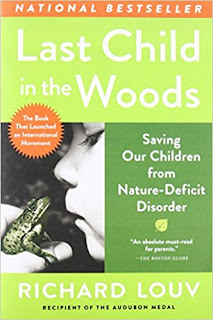 In this video, Richard Louv discusses Nature Deficit Disorder and how it impacts our culture. Ultimately, Last Child in the Woods is not all gloom and doom. Louv passionately argues that a return to the “way it was when we were kids” when parents just let their kids run around the neighborhood to climb trees and dig holes and ride bikes and play will at least partially heal a number of these social ills. He argues that it’s time for our culture to reacquaint our children with the outdoors. There is no doubt that those who read this book will be convinced. The only problem with his argument is that he is likely to be making it to the very people who already encourage their children to spend time outside. The following video is the second in a three-part series put together by backcountry access. Once again, I'd like to state the importance of having proper avalanche training before traveling into the winter backcountry. And proper training doesn't come from a two-minute video. "It's visionary. It's truly on the edge of what we could call climbing," says Arc'Teryx athlete Jesse Huey. "You can train for the Karakoram, for Alaska, but nothing can prepare you for this." This winter, Huey and his team of elite alpine climbers will journey to the roof of the world. When darkness falls, there will be light. 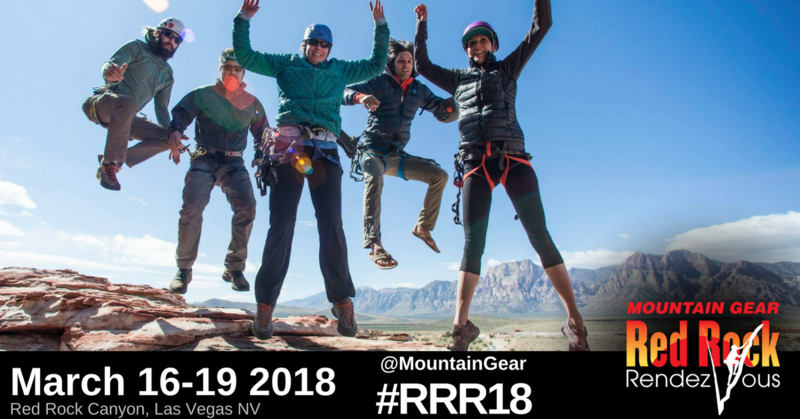 In conjunction with Petzl and Outdoor Research, the American Mountain Guides Association has produced a series of tech tip videos. In this particular video, AMGA Instructor Team Member Pat Ormond, talks about positioning a belayer during an ice climb. In review, the video states that "belayer positioning is very important in ice climbing due to falling ice. 1) During ice leads, consider down-anchoring the belayer so that they don't get pulled into falling ice. 2) When toproping, it's important to consider anchoring the belayer away from the base of the climb to avoid falling ice. 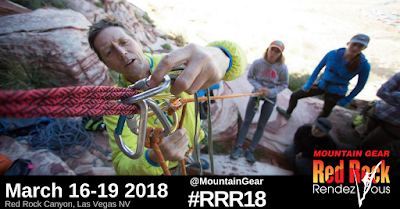 3) If you elect to use a down-anchor (ground anchor), the belay loop should be used, and not the back of the harness. --So this is absolutely nuts...! 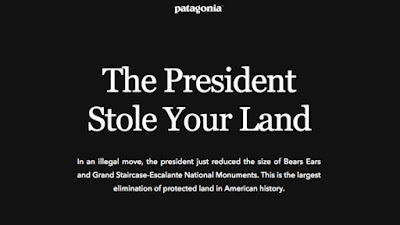 As you all know, Patagonia, the Access Fund and others are suing the federal government over Bears Ears. 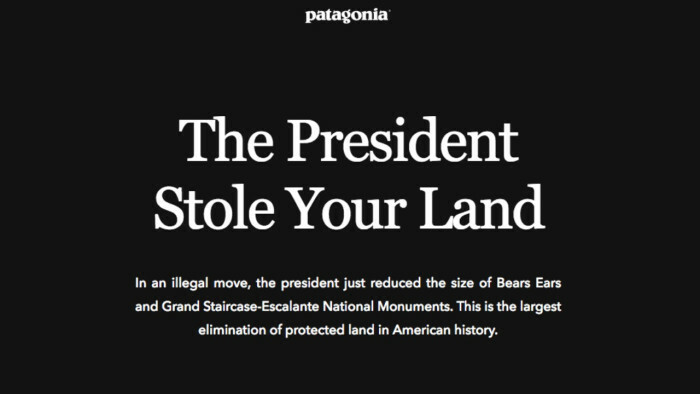 This action by the retailer did not go over well and the federal government responded, by putting up a banner on their official government feeds that said, "Patagonia is Lying to You." This is going to get ugly. To read more, click here. --The Las Vegas Review Journal is reporting that, "A lawsuit seeking to block development on Blue Diamond Hill is scheduled to go to trial. 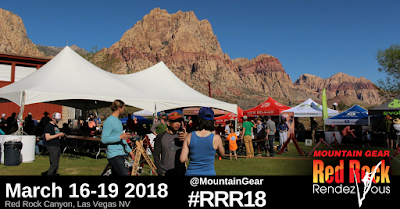 Environmental nonprofit Save Red Rock is scheduled to make its case before a Clark County District Court jury starting Sept. 4, 2018. 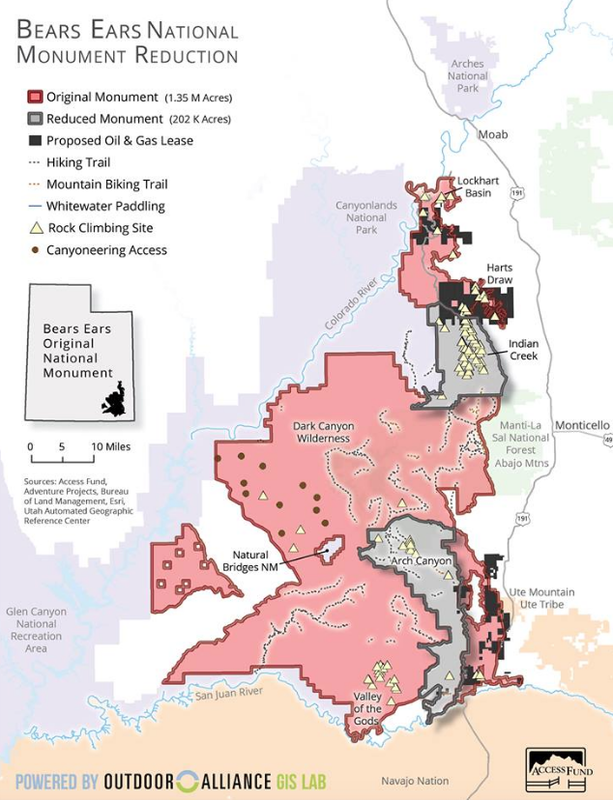 Save Red Rock is suing the county and Gypsum Resources, the company seeking to build as many as 5,025 homes atop a hill bordering the Red Rock National Conservation Area." To read more, click here. --Utah Republican Representative Bob Bishop has invited the founder of Patagonia, Yvon Chouinard, to testify before Congress about Bears Ears. To read more, click here. --A climber was killed after suffering a 60-foot fall in Cañon City. There is limited information on this incident. To read more, click here. --The Denver Post is reporting that, "A snowboarder died three days after losing control and hitting a tree at Keystone Ski Resort on Saturday, December 2, the first death at a Summit County ski area so far this season." To read more, click here. --The Know Outdoors is reporting that, "The National Park Service on Tuesday said it will trim the number of free-access days to four in 2018 from 10 this year and 16 last year. 'We hope that these fee-free days offer visitors an extra incentive to enjoy their national parks in 2018,' National Park Service Deputy Director Michael T. Reynolds said in a news release. But the move comes as the park service weighs public input on a plan to more than double gate-fees at its most popular parks. To read more, click here. 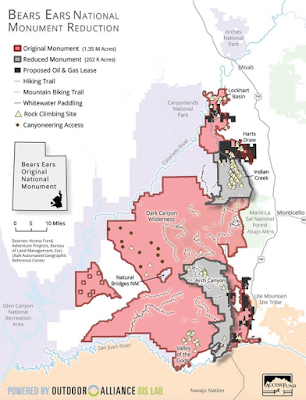 --The Denver Post is reporting that, "President Donald Trump’s downsizing of two massive national monuments in Utah sparked a furious backlash from American Indians, conservation groups and the outdoor industry, which moors its future in public lands. But over the past year, as Trump weighed the reduction of Utah’s 1.4 million-acre Bears Ears and 1.9 million-acre Grand Staircase-Escalante national monuments, the outdoor recreation industry has galvanized, using its growing clout to try to shift the president and Interior Secretary Ryan Zinke away from what it called an attack on public lands." To read more, click here. --Here's a happy report from the Access Fund: "Access Fund and Friends of the Ledges are pleased to announce that Band M Ledge in Madison, New Hampshire has been reopened to recreational climbing. Band M Ledge is a granite cliff offering 50 routes ranging from 5.5 to 5.13, with most routes falling on the upper end of the grade range. Due to its southerly aspect, the cliff offers climbers in the Mount Washington Valley with an option for late and early season climbing in a beautiful and quiet setting." --Outside magazine is reporting that, survey released Thursday by the Department of Interior shows that more than a third of employees have been harassed or discriminated against in the past year. The news affirms what has, at this point, become painfully clear: the department has a culture of bad behavior that has gone unchecked for years. The survey was initiated after reports emerged from the Grand Canyon in 2016 that women working for the National Park Service had routinely been harassed and, in some cases, assaulted while working on the river. Those complaints quickly spread throughout the NPS, prompting resignations and calls for further investigation. In October, the DOI released a survey of full-time NPS employees that found that 40 percent had experienced some form of harassment or discrimination. Thursday’s survey included other departments—from the Bureau of Indian Affairs to the U.S. Geological Survey—and included 28,203 respondents, representing 44 percent of all Interior employees. To read more, click here. --Five people were injured and dozens were left stranded when a Pennsylvania ski lift malfunctioned on Saturday. To read more, click here. --Outside has an interesting piece this week on women climbers. 2017 was a banner year for them, but every accomplishment was accompanied by controversy. Is this sexism...? Or just the caustic nature of new climbing accomplishments...? You decide. Check out the article, here. --And finally, speaking of Outside. It's possible, that an Outside reporter was banned from a press briefing because he wrote something negative about Ryan Zinke's fly fishing skill. To read more, click here. There are different kinds of bivies out there in the climbing world. Sometimes we use the expression to mean crashing in your truck bed the night before a climb (i.e. “Let’s bivy at the trailhead and get an early start tomorrow”). But really, bivy’ing is about climbing. A winter bivouac may include a snow shelter or snow hole to insulate from cold and the wind. Bivy’s on rock climbs often entail some kind of rock pile or cave if you’re lucky, or sleeping in slings if you’re not. There are shiver bivies, the kind where it keeps you up all night huddling next to your partner for warmth (note that it’s not romantic if it’s a survival situation). A few of the Leavenworth boys coined the term “shiverer bivering” when putting up Gorillas in the Midst a few years ago . There are also “moving bivouacs,” which means you just keep walking all night until the sun comes up ‘cause it’s too darn cold to stop. Planned or unplanned, bivouacs are a part of climbing’s heart and soul. Often on long routes you run the risk of a bivouac. To bivy or not to bivy? If you bring the extra gear, the weight will guaranteed slow you down, making the night out inevitable. But if you forgo the gear, you might end up out and unprepared. As one climber told me, “Light and fast” quickly becomes “cold and f****d!” Charlie Fowler even made a scale for bivouacs, based on how much you suffer. I’ve included a few different versions of what to bring to make the overnight a little more comfortable. It’s a warm-weather edition. A different setup is needed for going into the mountains in March! This kit is especially appropriate in the spring, summer, and fall trips where you’re doing a long, weight-conscious route and only want to bring the bare minimum survival gear. It is really good if you’re not going to encounter really cold temperatures. Long routes in Zion and Red Rocks, and summer routes in the Cascades and Sierras could be perfect for this kit. Besides the puffy and hat, this whole kit can fit into a sandwich-size Ziploc bag. The emergency blanket can act as a wind or rain barrier if you really need it, though it doesn’t breathe, so it’ll drip like you’re in the jungle after a few hours. But hey it’s really light and warm for the weight. I often roll an upper body layer around my feet, wrap myself in the emergency blanket and stuff my feet into my pack (if it’s big enough). This will keep your feet warmer and will keep your whole business from unraveling as you toss and turn on that tiny ledge 500 feet off the deck. The two Gu packets are for the next day. You’ll probably need em. This kit is great if you’re going to hike in and sleep at the base of the Ridge of Doom, and are going to come back down and sleep at the base of the climb afterward. This also works as a light bivi kit if you are going to bring one. The Sil Tarp is great. They’re expensive, but a super lightweight barrier from the elements. Twice, now, my buddy Matt and I have hunkered under that thing, strung out with cordelettes and trekking poles. It worked great. I use this one all the time in the summer alpine routes in the Cascades, where we will want a bit more protection from the elements and will be camping in snow. The shell of Hilleburg tents can be removed and used independently from the rest of the tent. So you have just 2 poles and the exterior tarp of the tent. This works great in the snow – “mid-style” – like a Mega-Mid, just a lot lighter. 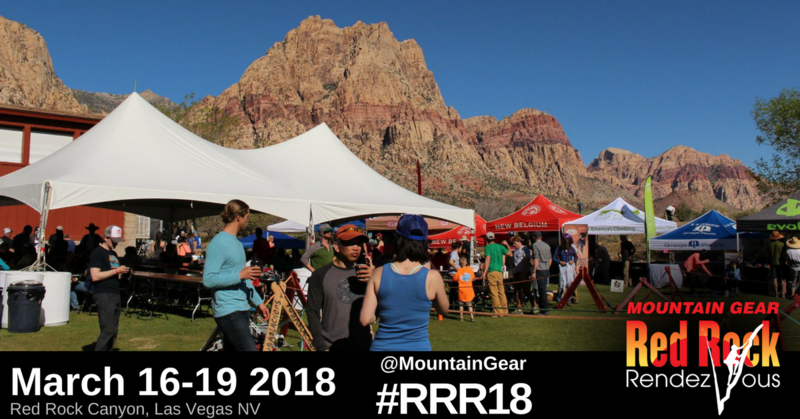 You can stake your tent with pickets, ice axes, wands, and other climbing gear. Try to avoid bringing stakes. The Jetboil is for heating up dinner and melting snow for water. You can use the foil pouch from a freeze dried meal as a high camp bowl. It’s light and folds flat! The full-length sleeping pad is great on snow. It’ll keep you insulated and dry. You can also use a half-length pad (i.e. RidgeRest or Neo-Air) and the framesheet bivi pad from your pack. This option is lighter but won’t insulate as much. Make the call based on the weather. When setting up for sleeping (if you’re lucky), always be the big spoon. Always check above you if you’re sleeping on route or on technical terrain. Be aware of rock/ice fall or avalanche potential. An extra little bit of food usually doesn’t weigh that much and can really help if you go long. Throwing in four extra Gu packets is probably not going to be the difference between sending and failure. I hear there’s a few half-length sleeping bags out there (from Brooks Range?) – they’re really lightweight, and meant to be used with a puffy jacket. There are emergency blankets that are shaped like sleeping bags. They’re great for wrapping yourself up in. Get a sturdy emergency blanket. I’ve seen some that tear just from removing them from the packaging. If it’s sturdy, you can reuse it, too. Try taking pictures of your friends during bivy’s. They’re guaranteed to look their worst and can serve as really good practical joke material later on! Remember to bring a headlamp. Otherwise, you’re definitely going to bivy! Okay, that’s all for now. Happy sleeping! --Mike Pond, AAI guide and instructor. So somewhere along the way I got a bit of a reputation. Seems that folks think I’m some kind of ice climber. Turns out they’re pretty right. In truth, I love all kinds of climbing. Depending on the time of year, I chase long alpine routes, big rock climbs, small rock climbs, ice routes of all shapes and sizes, and sport-rock, sport-mixed, and even some sport-trad (right…). I even bought a bouldering pad this year! But one of the coolest mediums to climb, in my opinion, is ice. I just love winter climbing (almost as much as I like summer climbing)! The ice changes so much from day to day, even hour to hour. Ice climbing can be remarkably different, too, depending on where and when you climb it. Water ice routes in the northeast and southwest, summer glacier ice in the Cascades, bullet-hard alpine ice in Alaska, or even the semantically challenging “snice” that forms from hardening freeze-thaw cycles in snow. One of my favorite things to teach, in fact, is ice climbing. I teach water ice climbing techniques in the winter, and teach glacier ice climbing in the Cascades in the summer. 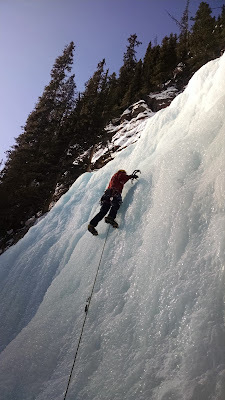 Both types of climbing certainly have their differences, but in general, the technique of ice climbing is transferable to all types of ice, just like how rock climbing skill transfers through its many flavors. This Pro Tips article is divided into three parts: form, gear, and clothing. The following picture will be good to dissect ice technique. It’s “mostly” all there. Let’s pick it apart, shall we? There are two basic positions for your arms. Number one, which is shown in this picture is the resting position. And two, which we’ll talk about below, is the lockoff. Which would you rather do – hang from a pull-up bar with your arms bent or straight? Of course, we all find straight arms easier. In this position, you’re hanging with the help of your skeleton, not from just your muscles. The result is that your guns will last a lot longer than if you hang with bent arms. It’s hard at first, and takes practice to make it feel comfortable, but it’s worth it. As you progress to steeper climbs, this will make all the difference. Compare that to the next picture. This climber is demonstrating the bent-arm technique that will get’cha pumped! This two-part picture demonstrates the sequence of swinging form. In the left picture, the climber is resting on a straight arm. In the right picture, he has moved his feel up (with arms still straight, right?) and is now swinging his left axe with a locked off right arm. The “lockoff” is the second-easiest position to be in. This is the same place as when you are hanging from the pullup bar with your head above the bar. It’s easier than the mid-position, bent-arm hang, but is much more difficult than hanging from a straight arm. So, this is used while swinging for the next axe placement, but is much more strenuous than hanging as the climber is in the left picture. Okay, back to the demo picture. Ice climbers, with their penchant for politically correct slogans, use the term “Swing like you screw, and kick like you poo.” While funny in a cute, weird sort of way, this is really valuable. While you’re swinging, you want to be locked off, and have your hips into the wall. When you’re kicking new steps, you want to have your arms locked off and have your hips out from the wall. This allows you to keep your heels down and make direct hits into the ice with your crampons. In general, smaller steps are easier on your body than big steps. You may need to take a few smaller steps up as opposed to one big step. I like my feet to end up about where my knees were at the previous break. There are a few things going on in this picture that I want to talk about. First, the right hand is using the higher grip on the ice tool. This is only possible with leashless tools (which I do recommend if you’re ready for it. But that’s a totally different issue). The top grips allow you to get another 4 inches or so above the bottom grip, which can allow you to have a straighter arm, and give you a little longer stride up. Only modern tools like the Petzl Nomic, Quark, Ergo, or Black Diamond Cobras have the second grips. The more comfortable, the better. Second, the two tools are about the same height. I usually avoid this, instead keeping one tool higher than the other. This allows you to swing fewer times for each step up you take. Sometimes, though, I will make two placements near each other, for traversing or for stability if the ice is a bit funky. Last, try to grip the ice tool as lightly as possible. I often play “twinkle-fingers” while practicing on toprope. When you are hanging from your straight arm, try to wiggle your fingers on your hand. The goal is to release the death grip from your ice tool. The more you clench your hand, the more pumped you’ll be. Try to find the position which holds the tool well, but doesn’t waste energy. Then, try and take this technique to all times when you’re hanging on your ice tools to save some grip strength. Ideally, when standing, your legs will be straight (again, to rest on the skeleton instead of your muscles, in this case the calves). You can lock them, or have a very slight bend in them. This climber’s legs are a bit too bent for “textbook” form. It will end up putting a bit too much strain on the calves, and will feel insecure in general. The telltale “Elvis foot” or “sewing machine leg” is sometimes related to this, although not all cases are attributable to poor form. Sustained climbing tends to fatigue calf muscles while ice or mixed climbing. So that gives a good overview of ice climbing techniques. Stay tuned to the blog for more technique tips to take you higher! Look at the difference between these two ropes! Where would we be without good ropes in the winter?! Ice climbing is a perfect storm for poor rope conditions. Water often flows down the ice flow, and down the rope itself. This water freezes, either just on top, or it soaks the rope entirely to the core. Then, the rope gets dragged through snow that sticks like Cheerios to honey, which further compounds the problem. Rinse, repeat. The picture above shows the difference between a brand new, dry-treated rope and a fatty, fuzzy, ice collecting rope you simply shouldn’t take out climbing in the winter. Notice not only how much ice and snow the purple rope has collected, but also how much wider it is. The rope was so stiff and frozen that I had to break the “ice cable” just to coil it. The green rope remains soft and supple, ready for another climb or three. Bottom line: use new, fairly thin (under 10mm), dry-treated ropes. If it’s fuzzy, leave it at home unless you want to be belaying or rapping down (!) frozen ice cables. It’s amazing how much a single picture can say. I’ll use this picture again, this time to talk about my technical systems while ice climbing in the winter. From gloves to ropes, screws, draws, and where to put your watch, I’ll go over as much as I think is reasonable and productive from this picture. I will name drop companies in this article, so I hope you’re okay with that. In general, I’m kind of well-versed in which companies offer good ice climbing gear. I’ve used a lot of it, and talked to people who have used even more. I’ll pass on what little I’ve learned, and will acknowledge any gaps in what I know. I’ll admit, though, that I do not know about every gear company’s ins and outs. I’m not sponsored by any company. (I am totally willing to try any gear out, by the way, so feel free to send me free gear. I promise I’ll use it). 1. Ice Tools. I like leashless tools. I think, given enough experience and strength, that leashless tools offer a greater range of skills and will leave you less pumped than climbing with leashes. It’s a personal preference, for sure. But for what it’s worth, a lot of climbers are going sans-leashes. I have tried the Black Diamond and Petzl tools. I climb with the Petzl Nomics. I think they climb the best, though they lack the mountain applications that the BD tools have (a spike, a good hammer, smaller grips for shaft climbing in snow). So if you’re thinking about doing that gnar-bar Alaskan or Andean mixed route, well, you shouldn’t belive me, go and try both out and decide for yourself. 2. Picks. Ice tools come with many pics these days. I use the mixed picks (Petzl Astro) for rock/mixed routes and the ice (Petzl Ice) picks for ice climbing. There actually is a difference in the way they climb. The ice pics enter and exit the ice easier, and the mixed picks grip the rock a bit better. I recommend using ice picks for climbs that are most or all ice. 3. Mono point crampons. For steep ice routes, and any time I go mixed climbing, I go mono-point. They give me the precision and accuracy I need. They also puncture the ice better, and won’t lever out in rock like twin front-points will. That said, a lot of high-end climbers use dual points. Bottom line: try out both and see what works for you. 4. Anti-balling plates. For everything but the crag, anti-balling (or “anti-botte”) plates are essential to prevent your crampons from balling up. Snow will collect over time – sometimes very little time – and make a big snowball under your feet. This will make you fall. New, lightweight crampons like the Petzl Darts are excellent (I have a pair), but ball up like crazy. If you’re going anywhere backcountry, bring a pair of ‘pons with anti-ball plates. 5. Lightweight helmet. The days of the construction helmet are over! Time to get a foamy! Petzl, Black Diamond, Camp, and probably a dozen other companies make great foam helmets. They’re lightweight, they breathe better, have a strong plastic shell on the outside, and, most of all, are comfortable. Yeah, they’re more expensive, but so is ice climbing. Get the good ones, and use them! Also, many foam helmets are designed to take a side impact, which also safer. 6. Harness. I’m actually not too picky about the harness, as long as it fits with and without several layers, has ice clipper slots, and is comfortable. I like them to have at least 4 gear loops. 7. Quickdraws. I usually bring a selection of regular quickdraws and extendable (24”) runners. Long ice routes or traditional mixed climbs may require up to 15 quickdraws. I typically, though, use under ten. 8. Racking gear. I like to put draws on both the front gear loops, leaving the two back gear loops for any rock gear (pins, cams, nuts) and anchor building and misc. materials (lockers, cordelettes, long slings, belay device, knife, v-threader, tat). 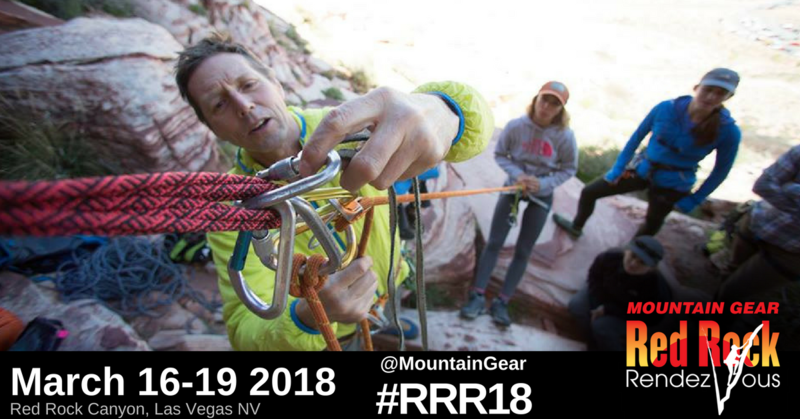 If I have a lot of rock gear, like when I’m doing trad mixed climbs or when I might be putting in rock gear near the ice, I’ll put the rock gear in the front gear loops and leave draws and anchor stuff in the back. A fifth gear loop helps to keep anchor gear in the back, out of the way. Some people climb with a shoulder sling that has either rock gear or draws. I don’t personally do this, but it’s not a bad idea. 9. Ice clippers. The only way to efficiently rack ice screws is with ice clippers. (If you have Grivel 360 ice screws, you’ll probably have to figure something else out). I usually have four on my harness, two on the right and two on the left. I can rack as many screws as I need for a lead, or clip my tools to them when I’m not climbing. By the way, a good habit is to clip your tools to your harness as soon as you finish a pitch – I have rappelled down without my tools more than once! 10. Ice screws. I use only Black Diamond Express screws – the ones with the color-coded spinners. They rack the best, come in easy colors, sink really well into the ice, have two clip-in points, and are the easiest to screw in. In my opinion, they are the best on the market. 11. Anchor building materials. I usually bring a double-length (48”) sling or two, a triple-length sling (72”), and a 20-foot cordalette. The double slings allow me to extend a piece of gear, sling an icicle, or do a two-screw ice anchor beautifully. The cordalette is for multi-piece anchors, or anchoring to trees. It also comes in handy if you need to leave some material for a V-thread, rappel anchor, pre-rig a rappel, or in case of self-rescue. The triple sling is basically a lighter version of a cordalette, with far less versatility and wears down faster. But it’s a lot lighter, so it works well. 12. Puffy jacket. I love my puffy. I bring it on most climbs, if it is at all chilly ouside. There are two ways you can bring it up: in a stuff sack or a backpack. The backpack option is a little faster for getting your jacket in and out, but stuff sack comes with you all the time and clips right to the harness. If I am doing a straightforward ice climb, I’ll usually opt for the stuff sack. If I’m going to do a mixed climb or one that has a lot of chimneys, I’ll bring a backpack. If it’s a longer climb and I have a backpack anyway, I’ll bring the pack, especially if I have some food and water with me anyway. 13. Half ropes. I usually use half ropes for ice climbing. The two ropes allow for longer rappels than one single rope. They also are lighter and stretch more if you take a fall on them. The #1 rule ice climbing is “don’t fall” but in case you do, you’ll likely appreciate the stretchy rope that puts less impact force on your ice screws (so it will be more likely to hold a fall and not pop out). 14. Knife. I always bring my little knife with me. If I need to clean up a rappel station or cut a V-thread, the knife will make that possible. Trango and Petzl both make really small knives that clip into a biner easily. Get one! 15. Emergency gear. Just in case. This category might be bigger or smaller, depending on the climb. I usually bring an extra prussik cord and a Petzl Tibloc. These will help for a pulley or if I need to ascend the rope. I may also bring an emergency blanket, first aid kit, bivi sack, sleeping pad, depending on the length and type of climb. “emergency” might simply mean “bivi gear” that doubles as splint-making material (like sleeping pads, extra cord, or even skis). Cilo Gear backpacks, as well as a few from other companies, have a built-in foam pad as the frame sheet to allow for a bivi pad or splint. Handy stuff! 16. Tat. If I am planning on rappelling with V-threads or if I am in the alpine, I will bring some kind of “tat,” or spare material like cordalette or half-inch webbing for leaving at rappel stations. You could always use your cordalette or a chunk of your rope (a bummer), but it’s a little cheaper and less emotionally scarring to use an old piece of webbing or cord. 17. V-Threader tool. There are a variety of V-threaders out there. Any one will do (including a piece of coat hanger wire). Grivel has the best, though – one that has a V-thread hook, knife, and built-in carabiner. It’s also the most expensive. On this one, though. there’s no need to go big and spendy. I’ll post a blog article soon about how to make your own V-threader tool. 18. Bullet Pack. Sometimes, on longer routes, I’ll bring a small pack. Sometimes called “Bullet Packs,” these are made by many companies. A 20-L size is usually good. Just something to hold some food and water, possibly another layer or some tat. If possible, I have the second carry it so that the leader can have less weight on while on the sharp end. when it comes to dressing for the coldest sport in the lower 48. Note that NONE of the gear is cotton. It’s all synthetic, which insulates when wet, dries easier and smells worse, too. 1. Base layer. A t-shirt will do. It is more comfortable than the R1 on your skin, and if nothing else, this layer keeps the R1 from smelling too bad. 2. R1 Hoody. This is a dream piece. It is comfortable, warm, and has a built-in hood/balaclava for your head and neck. It’s awesome. 3. Softshell or hardshell jacket. Depending on the location, weather, and how wet I think the snow and ice will be, I’ll decide between soft- and hard shells. A softshell is more breathable, but gets wetter and lets more wind through. Hard shells are water- and wind-proof, but are not as comfortable, and stretch less. 4. Expedition down parka or DAS parka. Again, depending on weather. If it is really cold out, the down parka is the warmer option, though it, like all other down, cannot insulate or dry out when wet. The DAS in synthetic, so will keep you warm when wet and can dry out with body heat if it does get wet. It’s not quite as compressible or warm as the other. Either way, I always bring a puffy with me. 5. Softshell or hardshell pants. Just like the jacket, I’ll base the decision on the anticipated conditions. Softshell pants are a lot nicer to move in, because they stretch so much, compared with hardshells. I like the Mixmaster pants because they have built-in R1 insulation and are suspenders, which is more comfortable than regular pants. It is nice if your pants can fit over ski boots and climbing boots, to allow more versatility. Most pants do this well. 6. R1 long underwear. I really like these. They’re warm and stretchy. I rarely go ice climbing in just pants with no insulation underneath. If it gets too hot and I have them on, I can usually regulate my temperature easily with upper layers easily enough. 7. Chilly-Grips. Find these at your gas station or Home Depot. They’re a synthetically-insulated glove with a rubber palm. They are cheap ($12) and climb really well. I use these only when it’s warm out. They’re great for mixed climbing. 8. Black Diamond Punishers. There are others out there that work well, but I have found these to be excellent. They’re totally waterproof, have good dexterity and grip, and are warm enough for most ice climbing. 9. Mitts or warm gloves. I love my hands, and want to keep them warm at belays. I can usually belay in big gloves and then switch to Punishers for climbing. I often carry the gloves I’m not wearing inside my jacket to keep them warm and dry. 10. Buff. I love my buff! It is great in the sun, the wind, over my face, or as a headband for extra style points. It’s a versatile neck gaiter that is stretchy, too. Available in lots of styles, so choose carefully which Buff will represent your personality the best. Mountain flair and function. 11. Socks. Medium weight, usually. Make sure they fit with your boots and are not going to cut off circulation to your toes from being too tight. 12. Hat. Get one that fits your head well and won’t ride into your eyes under your helmet. 13. Goggles. I often pack ski goggles with me if I’m going into the mountains, in case the wind is bad. They don’t weigh much, and often make windy weather tolerable. 14. Sun glasses. Ice and snow reflect a lot of light. It’s great to have something that will shield your eyes from UV radiation and falling ice. A one-two punch! 15. Watch. Altitude watches are nice, but usually not necessary for ice climbing. 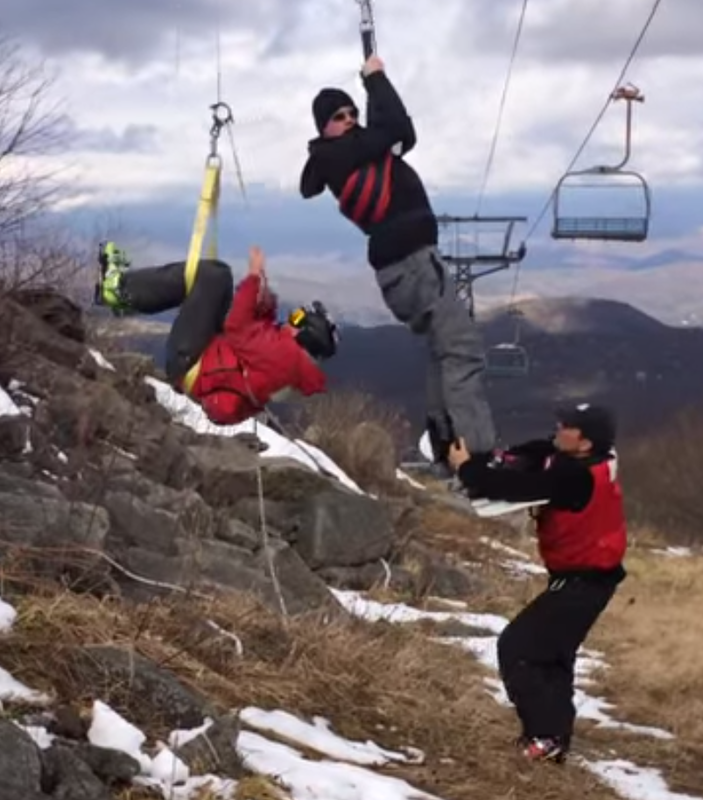 One of the many jobs that ski patrollers are responsible for is ski lift evacuation. In other words, when the ski lift stalls, they lower people off the lift to the ground. This is generally a relatively simple task that any climber with baseline skills would be able to accomplish. Unfortunately for a snowboarder at (ski area name redacted), the ski patrol there aren't very dialed into basic climbing skills. So there are a handful of takeaways from this, not-the-least-of-which is to avoid being rescued by a ski patroller in (state name redacted). Why would you be skiing in (state name redacted) anyway? Did you see what kind of snow they have in the video...? 1) Use an Anchor or get beneath the Victim! In the video, the ski patroller on the left is at a wide angle. Occasionally we are forced in a climbing setting to place a belayer far from the base of the crag. This happens in any top-roped climbing when situation where it is not possible to be close to the base of the crag. When there is a wide angle like the one in the video, the belayer is always pulled in. There are two ways to mitigate this problem. The first way is to anchor yourself down and the second way is to eliminate the angle. At the end of the video, the guy on the ground says to his hanging buddy, "you know next time...Ima' gonna have to get up there and hold ya'." Holding the other ski patroller wouldn't work. He could clip himself to the patroller to increase the weight, but the best thing of all would simply be to tie the belayer down. However, if the belayer was wearing a normal harness and wasn't using a "what-the-!%&@-is-he-doing strap," he might have been able to get directly beneath the snowboarder and probably wouldn't have needed an anchor at all. Ahhh...this one seems a little obvious. If the strap had slipped off the ski patroller's legs, the victim would have fallen to the ground. This is more in response to something that shouldn't have happened in the first place, but once both the ski patroller and the snowboarder are both hanging, they are essentially counterbalancing each other. If the ski patroller rappels, the snowboarder will remain where he is. Once the ski patroller is on the ground and continues to lower the snowboarder will come down. Had this situation been a bit different, the ski patroller might have had to counterbalance rappel with the snowboarder. In other words, the only way for the two of them to move together is for the ski patroller to clip something to the snowboarder and then rappel. As the patroller lowers, he would pull the snowbarder to the ground. Due to the lack of harness' and competence in this arena, this would not have been realistic for this team. These guys made some mistakes and they learned from them. Certainly, they won't do this this way in the future. --A missing backcountry skier was found in good condition on Monday near Revelstoke, British Columbia. To read more, click here. --Fox 40 is reporting that, "While snowboarding at Sierra-at-Tahoe Thursday, a man crashed into a fence and was killed. The 23-year-old snowboarder was on an intermediate trail around 1:15 p.m. when the incident occurred, according to Thea Hardy with Sierra-at-Tahoe." To read more, click here. --There was a serious climber injury in the Owens River Gorge on Saturday. A female climber fell from just above the third bolt on China Doll (5.8), dropped 35-feet and hit the ground. It's likely that the ground-fall was due to poor belaying. It's unclear whether the injured party will make a full recovery. To read more, click here. --Reuters is reporting that, "A U.S. federal appeals court on Tuesday upheld a lower-court ruling keeping a ban on uranium mining around the Grand Canyon, but also upheld a separate decision allowing a uranium mine nearby to open." To read more, click here. --The Salt Lake Tribune is reporting that, "According to a May 25 letter obtained by The Washington Post, Utah’s primary uranium producer and waste processor, Colorado-based Energy Fuels Resources (EFR), implored Interior officials to trim Bears Ears National Monument in ways that protect its assets just outside the monument’s periphery, which included the country’s last operating uranium mill." To read more, click here. --The Access Fund will sue the government to protect Bears Ears. To read more, click here. --Service dogs in Joshua Tree National Park will now need to have permits that they are valid service dogs. To read more, click here. --Rocky Mountain National Park climbing ranger, Quinn Brett is in the process of recovering from a severe fall in Yosemite that has left her paralyzed. CBS Denver has posted a piece on her recovery. To watch it or read an article on Quinn, click here. --Lyft is going to start to service Colorado ski areas. To read more, click here. --The New Hampshire Union Leader is reporting that, "U.S. Forest Service snow rangers hope Mount Washington’s first avalanche of the season will be a catalyst for a newly launched initiative to teach school kids and the public how to be safer on the highest peak in the Northeast. Frank Carus, the lead snow ranger, said two climbers were uninjured after triggering “a small avalanche” on Dec. 1 in Central Gully in Huntington Ravine, on the northeast side of the mountain." To read more, click here. An ice climber in the Canadian Rockies. --Apparently there have been some issues and conflicts over ice climbing ethics in the Canadian Rockies this season. Here is a short list of things ice climbers should consider to be responsible users. --And finally, this week we have a piece from the Onion about a man who keeps his keys on a carabiner and must rappel into his office building every day. To read the piece, click here. The first time I saw someone remove their skins without removing their skis, I remember being flabbergasted. My first thought was, "that was awesome." It is incredibly efficient to remove your skins without taking off your skis, but it takes some practice. In the following video World Cup Ski Mountaineering Racer Melanie Bernier demos a few easy techniques that will help with quick skin removal. So, apparently there's a guy out there who is the best of the best of the best of the best at belaying. Petzl has made a very funny video about this individual with all kinds of superstar climbers. It does look like this video was inspired by a section of a 2012 film called Almost Alpine where they have a very similar sequence. To see the video, click here. But skiing in the backcountry can be intimidating. Indeed, assuming one has easy black diamond movement skills, there are three elements that might keep a skier from venturing into the backcountry: equipment, avalanche danger, and navigation. Once an individual has been introduced to each of these elements, a journey into the winter backcountry seems far more reasonable. There are two major types of touring skis, telemark and alpine touring. Telemark skis are designed with a free heel that is never clamped down. This is in direct opposition to alpine touring skis. These skis are designed to have a free heel when moving uphill and a fixed heel for downhill skiing. Unless you are already a telemark skier, it is not recommended that you venture into the backcountry with a telemark ski. Most resort skiers will have a much better time transitioning to alpine touring skis. A backcountry skier rips down a clean line on a beautiful slope. There are dozens upon dozens of touring skis on the market. Each ski is designed with a different thing in mind. Some are designed to be super lightweight, whereas others are heavier, but are designed for better performance skiing downhill. Most of those that are new to backcountry skiing should use heavier skis to start with. While this adds weight for uphill travel, it will make the downhill portion of the day much easier to deal with, especially if the conditions are variable or difficult. There are two major types of backcountry alpine touring bindings on the market. The first is the standard AT set-up, which allows for a skier to easily step into the binding. And the second is the super lightweight tech binding. The first type of binding (Fritschi Diamir, Marker Duke, Atomic Tracker, etc.) will be easier for the standard resort skier to adapt to, but most people these days ski on the second kind of binding (Dynafit, G3, BD Plum, etc.). Like the skis, there are dozens of different boot options for AT skiers. The biggest difference between alpine ski boots and AT boots is that AT boots are designed to have both an uphill and a downhill mode. In other words, they flex forward and backward for good uphill movement. Ideally a new AT skier will be able to find a boot that works well for both uphill and downhill movement. Ski shop employees can help you find a model that works well for you. AT skis are designed to go both uphill and downhill, but they need assistance going uphill. You will need to purchase a good set of climbing skins to place on the bottom of the skis for uphill travel. These will then be removed for downhill action. A skier skins up a slope. And finally, you will need to carry four essential pieces of avalanche safety equipment. You will need an avalanche transceiver, an avalanche probe, a shovel and formal avalanche education. Nobody should ever travel in the winter backcountry without these essential items. The final equipment items on the list are an avalanche transceiver, an avalanche probe and a shovel. These items are for the worst-case scenario. They are in your kit so that you can rescue your partner after an avalanche. They are not avalanche repellant. An average of 27 people die in avalanches every year. Avalanches are a real threat and they kill people. There is really only one way for the new backcountry skier to adequately address avalanche danger. He or she will need to take a full 3-day Level I Avalanche Safety course. The best avalanche safety programs conform to American Avalanche Association standards. Locally, these are identified as American Institute for Avalanche Research and Education (AIARE) compliant programs. The American Alpine Institute provides AIARE Level I courses at Mt. Baker every weekend. Skiers regularly enjoy resort skiing in flat light buried in a fog bank. This marginally dangerous resort activity provides significant additional danger in the backcountry. Obstacles with difficult visibility are only the beginning of the problem. You also need to know where you are and how to get home. There are four additional tools that the backcountry skier should learn to use. These are a topographical map, a compass, an altimeter and a GPS. These are all tools that you can learn to use by playing with them in the frontcountry; and you can find numerous resources online to help you understand these tools in order to use them effectively. Historically GPS units have been very expensive. However, today there are a number of apps that can be used on your phone in airplane mode. My personal favorite is Gaia, but there are several others out there as well. These apps are not super intuitive though and will take time and practice to perfect before using them in the field. The fastest way to get dialed into all of this is to take a course. The American Alpine Institute has several courses available. To learn more, check out our list of backcountry skiing, splitboarding, and avalanche safety programs. Resort skiing is great, but in a straight-up comparison, backcountry skiing is just more fun. There is a lot more that you have to know. Your skiing skill has to be a great deal higher and earning your turns just feels more rewarding. It is well worth any resort skier’s time to step off piste and to explore the world of backcountry skiing.